"Helden Von Heute (Alles Wartet Auf) (Today's Heroes)"
(1981) "Der Kommissar (The Commissioner)"
(1982) "Dancing in the Shadows"
(1982) "'Deep in the Dark'"
"Der Kommissar" is a song first recorded by Falco in Austria in 1981, covered a year later by After the Fire. Originally written by Robert Ponger and Falco, the Falco version reached the top of the charts in many countries. After the Fire's version featured English lyrics by the band's Andy Piercy. The song peaked at No. 5 on the Billboard Hot 100 charts. "Der Kommissar" ("the commissioner" or police chief) was originally written by producer Robert Ponger for Reinhold Bilgeri. Bilgeri turned it down as he felt the song was too soft, so Falco reworked the song for himself instead. 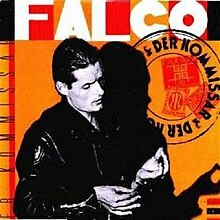 Falco wanted to release "Helden von heute" as the main side (A-side), but the record company wanted "Der Kommissar" to be released, because they felt it had more potential. The record company decided upon a double A-side release and was vindicated when "Der Kommissar" reached No. 1 in German-speaking countries in January 1982. After this success, Falco's management decided to release "Der Kommissar" (as an A-side) in other countries as well. In the United States and the United Kingdom, Falco's hit did not fare as well, despite topping charts throughout Europe and Scandinavia during spring and summer 1982. In the summer of 1982 the British rock band After the Fire recorded an English version of the song, also called "Der Kommissar", and released it as a single, but the record floundered. Coming off a tour opening for Van Halen, After the Fire was working on material for a new album when in December 1982 the group announced onstage during a concert that they were disbanding. Both the After the Fire and Falco versions were rising on the Canadian charts at the time, but neither had cracked the US pop charts. Around that time, American pop singer Laura Branigan began working on her second album, and recorded a new song written over the melody and arrangement of "Der Kommissar", called "Deep in the Dark", which was prepared for release, when the After the Fire version finally hit the US charts (Hot 100) on February 22, 1983, and started rising. Though the UK band's version barely nicked their home country's Top 50, in 1983 the song ultimately rose to No. 5 in the US, where their music video was an MTV hit. The song entered the American Top 40 on March 5, 1983, peaked at No. 5, and remained in the Top 40 for a total of 14 weeks. The single was released under the Epic label, with a catalog number of 03559. Amidst all this renewed attention to the composition, Falco's own version, which had done well in some US markets but not charted nationally, was re-released, but the German-language record remained essentially a novelty hit there, charting concurrently with the After the Fire version but not rising above No. 78. In Canada, Falco's version had peaked at No. 11 the same late-January week that After the Fire's version peaked at No. 12. After the Fire's record company, CBS, pleaded with the band to regroup, but to no avail. While UK promos for "Deep in the Dark" were pressed (the After the Fire version missed the UK top 40 and the Falco version didn't even chart there), Branigan's record company, Atlantic, officially released "Solitaire" in the U.S., where that song went to No. 7. "Der Kommissar" / "Helden von heute" is a double-A-side single by Falco released in Austria and Germany in December 1981. "Der Kommissar" reached the top of the charts in many countries. The song recorded for other side of the record, the pop-rock "Helden von heute" ("heroes of today"), is a tribute to David Bowie's "Heroes". It was recorded in Berlin, Germany; Falco claimed in an interview that he went to Berlin to follow the "tracks" left there by David Bowie, with his albums "Heroes" and Low. In the official music video for Falco's German language version of "Der Kommissar", Falco is shown in front of a blue screen while stock footage of police cars driving the streets at night play behind him. Falco runs in place (to simulate running from the cops) while lip-synching the song. Another music video for the Falco single released in Europe also exists. "Der Kommissar (The Commissioner)" only reached No. 74 in the US Cash Box Charts in 1983 and did not even chart in the UK, but Falco would break through with major hits in those countries two albums later, with "Rock Me Amadeus" and "Vienna Calling" in 1986. Updated remixes of "Der Kommissar" were released by Falco in 1991, 1998, and posthumously in 2008. After the Fire recorded a 1982 English-language version of "Der Kommissar" which peaked at No. 5 in the U.S. Pink Project sampled the guitar riff and chorus, mixed it with their electronic version of "Da Da Da" and launched it as "Der Kommissar" in 1982. Laura Branigan's "Deep in the Dark" from Branigan 2 is a 1983 English-language song written over the melody and hooks of Falco and Ponger's "Der Kommissar"
Dale Bozzio, the lead singer of Missing Persons recorded "Der Kommissar" in 2007 for her solo project. ^ Stewart Mason. "Der Kommissar - After the Fire | Song Info". AllMusic. Retrieved 2017-04-28. ^ "Cash Box Top 100 4/23/83". Cash Box Magazine. Cashboxmagazine.com. 1983-04-23. Retrieved 2012-10-11. ^ "Pink Project - Der Kommissar (El Comisario)". Discogs (in Spanish). Retrieved 2017-05-26. ^ a b "Top RPM Singles: Issue 6194." RPM. Library and Archives Canada. Retrieved 3 January 2019. ^ "The Irish Charts – Search Results – Der Kommisar". Irish Singles Chart. Retrieved June 6, 2018. ^ Whitburn, Joel (2004). Hot Dance/Disco: 1974-2003. Record Research. p. 95. ^ Whitburn, Joel (2004). Hot Dance/Disco: 1974-2003. Record Research. p. 17. This page was last edited on 4 January 2019, at 01:32 (UTC).